It’s two weeks before their wedding and Andy and Jen have just moved into their new home. They are planting a commemorative tree in the side yard when the mail truck stops at their curbside mail box. The delivery man climbs out of his vehicle and waddles towards them. Their first thought is that there will probably need to be another upward revision for the caterer—which has already cost them dearly. Instead, he presents Andy with a registered letter with no return address. He opens the letter and discovers that Mandy, the girl he took to the senior prom in high school and ended up with in the back seat of his father’s car with his pants down to his ankles, beer cans strewn all over the place, and a cop banging on his window with a flashlight, is sending his nine year old son, who he didn’t know existed for a weekend visit. Jen loses it and threatens to shoot the plane out of the sky before settling down and accepting the situation. Ike, whose picture looks like a miniature clone of Andy, shows up on Saturday morning with scraggly, unkempt, purple hair, a skull and crossbones earring, and an attitude. The stewardess has two documents for him to sign—an airline agreement for safe delivery of the minor and another registered letter from the Miami court system. Mandy has terminated all parental rights and turned the child over to Andy. I downloaded Taming Little Ike on Tuesday and finished it on Wednesday. I laughed when Ike got stung and tears when Jen fell and Ike called her mom. I completely enjoyed the whole book and rated it five stars. Will read another one soon. Still shopping? 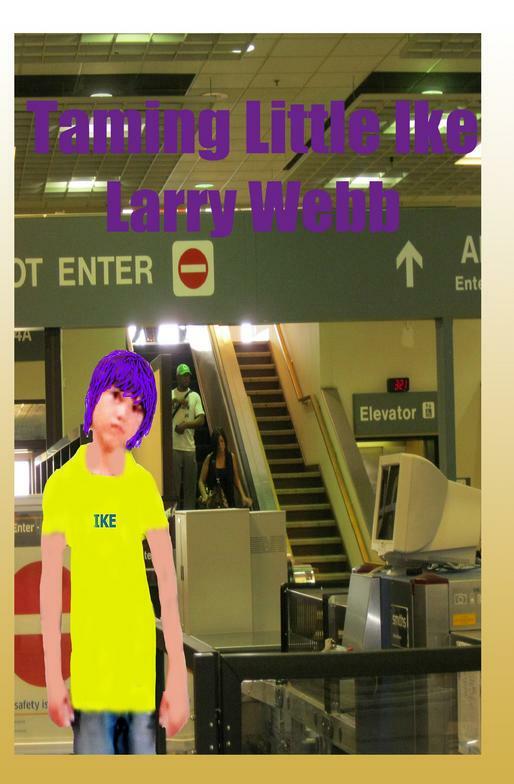 A local author has a great book out for kids and adults, "Taming Little Ike," that can be purchased for the Nook or Kindle or paperback through Barnes & Noble, from Amazon, or directly from his website http://www.larrywebb-author.com/. Imagine that your wedding is two weeks away and the postman shows up with a letter from an old girlfriend letting you know that you have a nine-year old son (prom night) who will be arriving at the airport and waiting for you to pick him up. Talk about a kid with an attitude -- and your new life begins. A funny, too true story that is a very entertaining read. Good Book - good story. Quick read and leaves you with a warm, fuzzy fealing at the end. Enjoyed the references to places I'm familiar with, as I grew up in the area where this book is set. This is an enjoyable read that is different from the books in Larry Webb's "As Life Goes On" series. At first I was surprised at the slow pace of the book, but it turns out this is a low-key, gentler book than the books featuring Jeremy and Scott ("As Life Goes On" and "As Life Moves On"). This is a book about a family that forms in an unusual way and how everyone in the family has to adjust to the situation to become a family. As usual when I review one of Larry's books, I object to some of the language the author uses because I still think the most natural audience for Larry's books are teenagers (he disagrees) and I would rather that some of the bad language didn't appear in the book for that reason, but then again I've lived a sheltered life and am kind of a prude and so maybe most people--teenagers included--would not be bothered by the occasional swear word and off-color phrase. The main characters are all nice people and there are a lot of funny episodes along the way, so I would recommend the book for anyone not looking for crazy plot twists or other storytelling fireworks. "Taming Little Ike" might not be a five-star book like "Gone with the Wind" is a five-star book, but Larry is my friend and I can't help giving him a friendship star or two in my reviews. Good job Larry and I'm looking forward to "As Life Continues," the third book in the "As Life Goes On" series. My favorite overall theme of "Taming Little Ike" is the feeling of a parent taking the responsibility of having a child, even if he didn't know he had a child for the first 9 years of that boy's life. Yet, in sharp contrast, how another parent could allow her child to be abused and eventually choose the abuser over her own child! It felt so good to read about the love and acceptance given to that little boy! The broad spectrum of the father's and step-mother's feelings and their parenting was portrayed so well. I felt like I knew the family and wanted to say "Job well done" to them. Thank you Larry Webb, for another enjoyable book! Buy "Taming Little Ike" now at Amazon.com. Click here. Buy "Taming Little Ike" now at Barnes & Noble.com. Click here.